Increase efficiency: Restaurant chains such as Sweetgreen, Bluestone and Tender Green are only accepting plastic and are finding immense success. 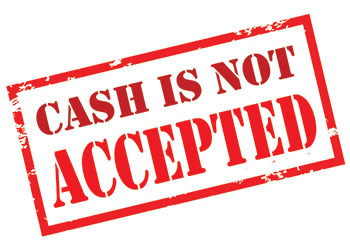 Tender Green has gone cashless in their 28 stores creating more revenue as there is no need to pay for armored trucks and bank fees for depositing money. Not to mention, those that work in restaurants noted that they save time not having to count cash daily. Also, customers save time in line because they don’t have to wait for change. In fact, on average, ordering is 20 seconds faster, making customers less frustrated about the wait. Customers purchase more: Having cash can be limiting. For example, if a customer is paying $10 for something but only has $15 in their wallet they may not want to buy the item. With a credit card, there is no visible limit and $10 does not look like much. In fact, studies have found the that more images associated with credit cards seen compels customers to buy more and leave larger tips. Bottom line … restaurants experience increased spending when customers charge. Attract Millenials and Gen Zers: Thriving restaurants are keeping up with the cashless trend that millennials and gen zers have become accustomed to as a result of apps such as Venmo and Apple Pay. With Apple Pay, customers now have “mobile wallets,” creating even more of a reason to not carry cash. Venmo is an app that makes it easier to split meals with friends. By offering customers the ability to pay with these apps, you will increase your customer base.